Farmers have hit back at claims of widespread mistreatment of bobby calves, after a video emerged of calves being thrown onto the back of trucks. The hidden-camera footage, obtained by activist group Farmwatch, also showed calves being dragged along the ground. The Ministry for Primary Industries (MPI) has condemned the treatment, and started a full investigation. But many farmers and farm workers say what was shown on the video did not reflect the reality of the industry. . .
DairyNZ chief executive Tim Mackle says cruel and illegal practices are not in any way condoned or accepted by the industry as part of dairy farming. “The vast majority of farmers care about their animals and we are committed to farming to very high standards. “DairyNZ works closely with the wider industry in the management of bobby calves, including the transport sector, meat processors and dairy companies, as well as Federated Farmers and MPI.” . .
“You are going to be the rock stars for the future consumers,” New Zealand Merino chief executive John Brakenridge told about 100 merino growers in Omarama yesterday. Speaking before the company’s annual meeting in the township, Mr Brakenridge said new brands were emerging where consumers could get to know the producer. He had just returned from the United States, where he met former All White Tim Brown, the co-founder of shoe company Allbirds which has produced a shoe made from New Zealand merino. . .
An award-winning Taranaki dairy farm will enter a new era next season as family beckons for its long-serving sharemilkers. The couple, who have been herd-owning sharemilkers on Faull Farms’ Trewithen Farm at Tikorangi since 2004, are retiring at the end of the 2016-17 season. The partnership between Faull Farms and the Penwardens won the inaugural Taranaki Ballance Farm Environment Awards (TBFEA) in 2014. . .
After two days of fierce competition, which included cooking a steak and flying a helicopter, the perfect woman for 2016 has been found. The Perfect Woman competition returned to Wanaka at the weekend, after a year off in 2015, and 16 contestants took part. Shepherd Rachel Rule (22), from Tokanui, took the title and $1000 in prize money. Miss Rule did not expect to win. She said the best part of the weekend was meeting the other competitors. “It was a fantastic weekend with just a great bunch of girls and the things we got to do, like flying a helicopter, were really amazing.” . .
It’s been a stressful spring for farmers in the Waikato with constant rain causing all sorts of problems, but those stresses were put into perspective in a big way for me last week when I attended two funerals. When people say life is short they’re usually talking about living until you’re in your eighties, so when you are at a two-year-old child’s memorial service, it’s just not right on any level. Mason was just two when he came to stay at our farm a few weeks ago with his mum and dad and five-year-old brother Weslley. . .
Saffron growers and wine-makers are among the businesses swearing by the benefits of organic compost made from Christchurch city’s green waste. Te Anau saffron growers Steve and Jo Daley were even prepared to pay up to $2500 a load to get compost trucked the 650km from the Living Earth processing plant at Bromley. The Living Earth market was 95% rural based, included pastoral and cropping farmers and the rural sales were 85% repeat business, the company’s rural and urban sales manager Graeme Wright said. The Daleys were determined to be organic growers and the cost was worth it for them, with the consistency of the compost and its ability to hold its properties through a hot, dry summer. . . Dairy milk has been flying off the supermarket shelves as consumers continue to sympathise with Australia’s dairy farmers, following the Murray Goulburn crisis. But so-called “alternative milks” are rising in popularity, and new research shows consumers are increasingly lapping them up. “While the incidences of lactose intolerance have been increasing there have also been food trends that recommend avoiding cow’s milk,” IBISWorld analyst Lauren Magner said. . .
Australia takes the pulse of wine grape markets, while the Northern Hemisphere harvest appears set to fall on the short side, and China headlines developments in global wine trade, according to Rabobank’s Global Wine Quarterly for Q4 2016. Highlighting the key role of the China/Hong Kong market in Australia’s wine grape price recovery, the performance of the Chinese market remains a key barometer of future red wine grape market condition. The premiumisation trend in other major markets is also a factor, namely in Australia’s domestic market, as well as in the US and Canada. . . Nominations for the Fonterra Board of Directors’ Independent Nomination Process candidates and the Shareholders’ Council, Directors’ Remuneration Committee, and Fonterra Farmer Custodian Trustee elections closed at 12 noon today. The candidates successfully nominated following the Independent Nomination Process will be announced on Friday 4 November, 2016. The full list of candidates, including Self-Nominated candidates for the Fonterra Board of Directors’ Election will be announced by Wednesday, 16 November 2016. . .
Do not cross this pasture unless you can do it in 9 seconds, because the bull can do it in 10. Growing saffron and Fiordland might sound an unlikely combination. But Te Anau couple Steve and Jo Daley have big plans for their fledgling organic operation with an ambitious goal of becoming world-renowned for the costly spice. “It’s just so damn exciting, the product, and people are so interested in what we’re doing,” Mr Daley said. Mr and Mrs Daley have 1.5million crocus corms on their property and their intention is to increase that to 50million, which would make them the biggest saffron producers in New Zealand. With a day job as a fencing contractor, Mr Daley, while stationed behind the post driver, got thinking about other ways to make a living. . .
For Clayton Buckley, the past 12 years working for Almarai — the world’s largest vertically integrated dairy company — have been quite an experience. Suffice to say, it was ‘‘not like farming here’’, he said during a recent visit home. Mr Buckley (35) was brought up in North Canterbury, where his father Russ was a ‘‘part-time’’ deer farmer. He used to head south during school holidays to stay with his aunt and uncle Gail and Trevor Meikle and help on their farm, near Oamaru. He enjoyed it so much that when he was about nine, he announced to his parents he was going to buy Mr and Mrs Meikle’s farm, he recalled. . . The number of deaths from quad bike accidents has reached a record annual high of 14, and an agriculture expert says the rate is predicted to rise. A quad bike accident in Taupō on Saturday night left one person dead and another with moderate injuries, bringing the number of deaths from quad bikes this year to 14, a record for a single year. The former director of Lincoln University’s Telford campus, Charley Lamb, said the deaths were occurring as a result of crush injuries, which research showed roll bars would prevent. “Very few bikes have roll over protection, which of course they should do. Whether people want to debate that and argue that, they can. But they used to do the same about safety frames on tractors and they did the same about seatbelts in cars.” . .
Fonterra has criticised proposed changes to the Dairy Industry Restructuring Act as not going far enough because they continue to impose constraints on the co-operative that help its competitors. The proposed changes to DIRA announced by Primary Industries Minister Nathan Guy provided a mixed bag for Fonterra which its Farm Source chief operating officer Miles Hurrell labelled a “lost opportunity to address artificial constraints”. While an end was in sight for the requirement to sell milk to its largest competitors, Hurrell said Fonterra was still obligated to accept and process all milk produced which meant shareholders having to invest in stainless steel. . .
Three directors, including founder and chairman Graham Cooney, have stepped down from the board of Blue Sky Meats due to an age-related clause in the company’s constitution. A letter sent to suppliers of the Southland-based meat company this week, signed by chairman Scott O’Donnell and directors Peter Carnahan and Andy Lowe, said Mr Cooney, Peter Houlker and Malcolm McMillan were unable to continue as the constitution precluded any individual from being a director once they reached 65. . .
Agri businesses are bad at attracting the right staff rather than being victims of a shortage of skilled and experienced people, Synlait Milk chief executive John Penno says. “Effectively, I’m saying our primary industry business models are not strong enough to compete for the right people. “We need leaders growing up in our businesses and we need businesses growing these leaders.” Penno focused on the challenges of knowledge and skills for land-based industries towards 2030, in a presentation to an Agricultural and Horticultural Science Institute forum. “This really made me think,” Penno said. . . Dairy Women’s Network has a new skipper at the helm after today’s AGM, with incumbent chair Justine Kidd stepping down and Cathy Brown of Pahoia being warmly welcomed into the role. A crowd of about 60 DWN members, staff and sponsors gathered at Wintec in Hamilton today to celebrate another successful year for the 9000-strong not-for-profit organisation that is dedicated to supporting and inspiring women to succeed in the business of dairying. Brown has been involved with DWN since the late 90s, first hearing about the organisation when she worked at CRV Ambreed. 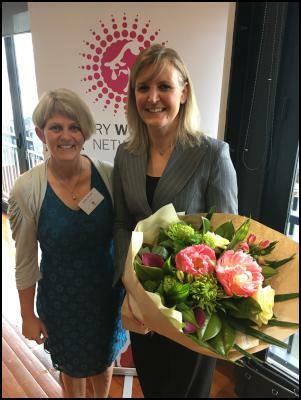 She quickly became a member of what was at that point a largely internet based network and attended the organisation’s first conference in 2001. . .
Cathy Brown (left) with Justine Kidd. Two words I find invaluable when training dogs are “good dog”. The secret to their effectiveness is understanding, timing and correct usage; overuse them and their power is lost. Not only do you need to understand when and how to use “good dog”, but the dog needs to understand the meaning. I once commented to someone, “You never say ‘good dog’.” And the next thing he was like a stuck record with the words; the trouble is he may as well have been speaking a foreign language because the words had no meaning for his dogs. . .